A few more loggings by JE. As for my own loggings they are still at home in my stationary PC so I will have to add to ´this later. However, nothing special about the conditions Feb. 18-20. What is a QSL - and why bother? What is a QSL? you may ask. Many visitors of this blog will have a very clear answer. It is a confirmation of reception of a particular radio station. You have heard a specific radio station at a certain time, sent them a reception report to tell them that you heard them and how well the signal was received. In return you will (hopefully) get a QSL - a confirmation that you have heard the station. The term 'QSL' initially is an abbreviation of the Q-code used in telegraphy communication, meaning simply 'I confirm our contact' or 'Please confirm our contact'. It has been widely used by telegraphy operators and radio amateurs (hams) over the years. So what has this got to do with broadcasting stations? 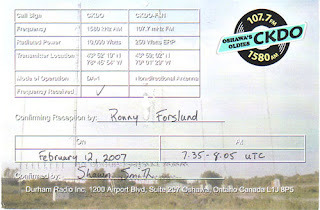 It used to be common practice for most radio stations to respond to listener's reception reports by a QSL, either in the form of especially designed QSL cards (verification cards) or by letter. For the listener (or DX-er, as they became known) these QSLs were nice memories of the contact with a foreign station and many radio listeners started listening to foreign stations and sending reception reports (that is, DX-ing) from a collector's point of view. 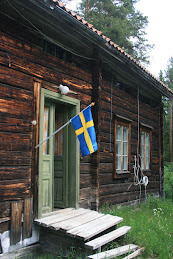 Many even decorated the walls of their listening post with the QSL cards received. What was in it for the station, then? Well, in the early days of radio many stations were dependent upon reception reports from listeners in order to establish how far they were reaching and how their signal was being received. It became a win-win situation and the DX-ers were collecting verifications/QSLs just as stamp collectors collect stamps. Many DX-ers also started collecting stamps as many QSLs from abroad were sent in envelopes with exciting stamps and often the stations would send out promo material, stickers, pennants and so on together with the QSL. As time passed by the need for reception reports from listeners disappeared but yet many stations kept on sending out QSLs anyway as a matter of courtesy and in many cases because they saw it as an interesting form of interaction with their listeners. Naturally, this was most useful for external service broadcasters and over the years they have often published series of different QSL cards to stimulate listeners to keep sending in reception reports. Today many broadcasters have no idea what a QSL is and what the point is of confirming that somebody across the sea have heard their station. To most broadcasters, long distance reception is not as exciting anymore as it used to be. After all, you can listen to webstreams or via satellite radio. So what's the point, really. Why are there still people out there who bother to listen to foreign stations the old-fashioned way by a radio receiver and an antenna and take the time to send reception reports? Well, as I am one of these peculiar persons myself I think the main reason why I keep on doing it is the excitement when after many endeavours you suddenly hear a rare station on the band. Just like a stamp collector will be happy in finding a rare stamp, a verification from a rarely heard station is the icing of the cake. Especially when it comes by ordinary post just it used to in the days before e-mail was introduced. After all, what's so exciting about a short e-mail telling you "Yes, it's us alright!"? I know that many DX-ers have given up and accepted the fact that they will only get e-mail replies in the future. Personally, I think this is sad. This attitude is killing the collecting part of the hobby which was the reason that many of us once started DX-ing. I value a "real" QSL coming by post much more than an e-mail, no matter how rare the station may be. After all, wouldn't a stamp collector rather have the actual stamps in his collection instead of scanned images of the stamps? I think this focus upon e-mail verifiations has made the hobby less interesting. There was a time when it was really exciting to check your mailbox (and I'm talking about snail mail here) every day and when there was a thick envelope with exotic stamps in it you knew you had a new QSL from a distant radio station. The ultimate trophy of the DX hunt. Somehow an e-mail reply will never give the same feeling and I'd rather stop sending reception report entirely than concentrating on getting e-mail replies. No matter how rare the stations heard may be. CKDO 1580 in Oshawa, Ontario, Canada still sends out QSL cards and the station has a highly enjoyable oldies format which I enjoy listening to every time they come through. 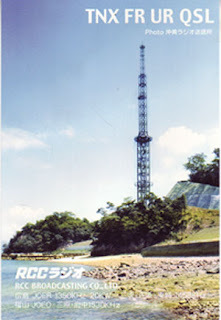 Japanese AM (medium wave) stations still often confirm reception reports by real QSL cards. Here is one from JOER 1350 Hiroshima which is regularly heard in wintertime. 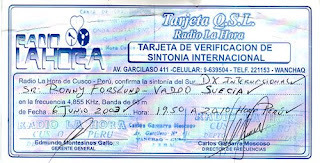 Our dear friend Carlos Gamarra Moscoso have helped many of us getting QSLS from Peruvian stations over the years. Here is one from Radio La Hora 4 855 kHz. So maybe there is still hope for real QSLs - or what do you think? Or does it really matter? It would be interesting to hear your thoughts on this.